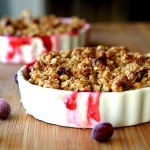 This is such a great dessert for fall and it’s SO simple to make! We used these six inch tart dishes and got two servings, but you could use traditional ramekins and it would make four individual servings. 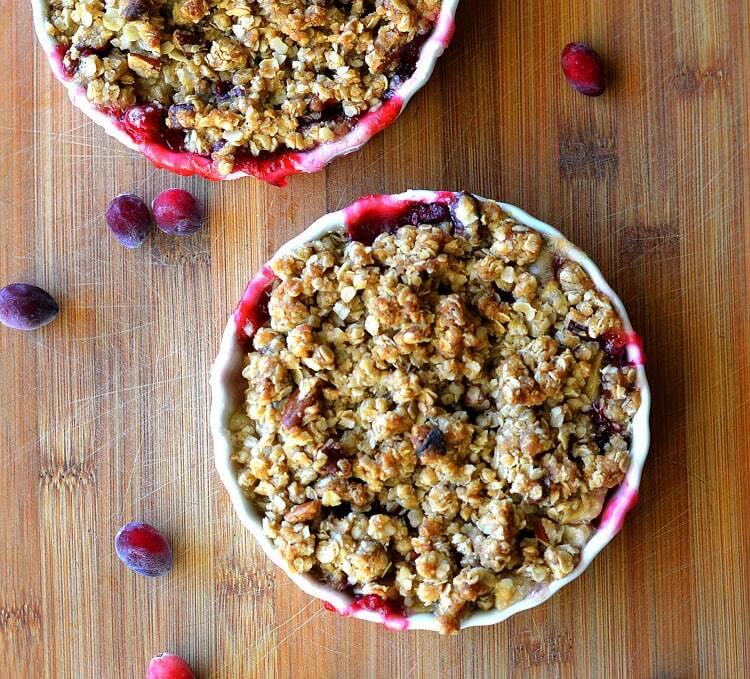 This Easy Cranberry Apple Crisp is best served warm with a scoop of a vegan So Delicious Dairy Free Almond Milk Vanilla Ice Cream. Yum! There are only nine ingredients in this dish. It begins with apples and cranberries combined with sugar and a small amount of flour to help thicken. The topping consists of quick-cooking oats, flour, brown sugar, melted vegan margarine (such as Earth Balance) and chopped pecans. You’ll want to place these crisps onto a lined baking sheet because there WILL be some bubbling over. It’s inevitable. Once baked, you’ll want to let these cool slightly before serving. That filling is very, VERY hot. Serve with a scoop of vegan So Delicious Dairy Free Almond Milk Vanilla Ice Cream and you have an easy, festive dessert. 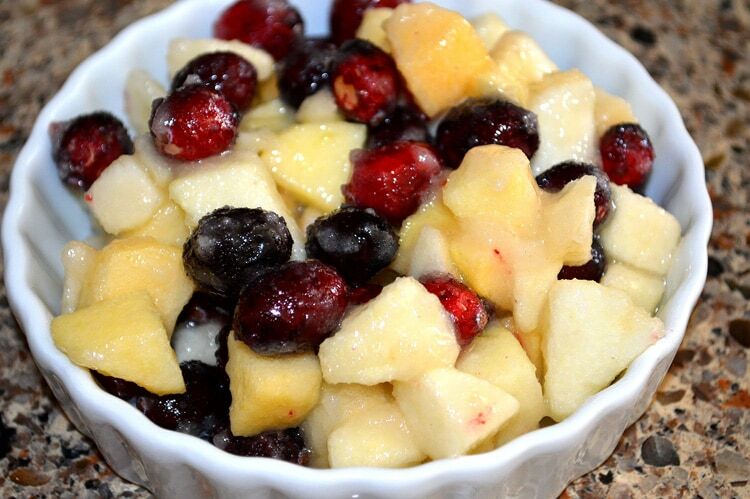 In a bowl, combine the apples, cranberries, sugar and flour. Set aside, stirring occasionally. In another bowl, combine the oats, flour, sugar, melted vegan margarine and chopped pecans. Be sure the mixture is coated with the margarine and resembles coarse clumps. 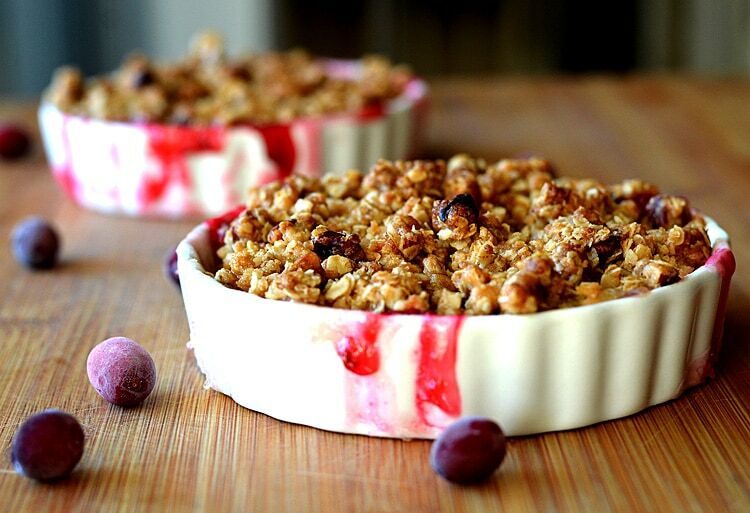 Spoon the cranberry mixture into individual ramekins or baking dishes. Crumble the topping mixture over the cranberry mixture. If you are using the individual ramekins, some bubbling over is usually invevitable. Place them on a lined baking sheet to catch any drippings. 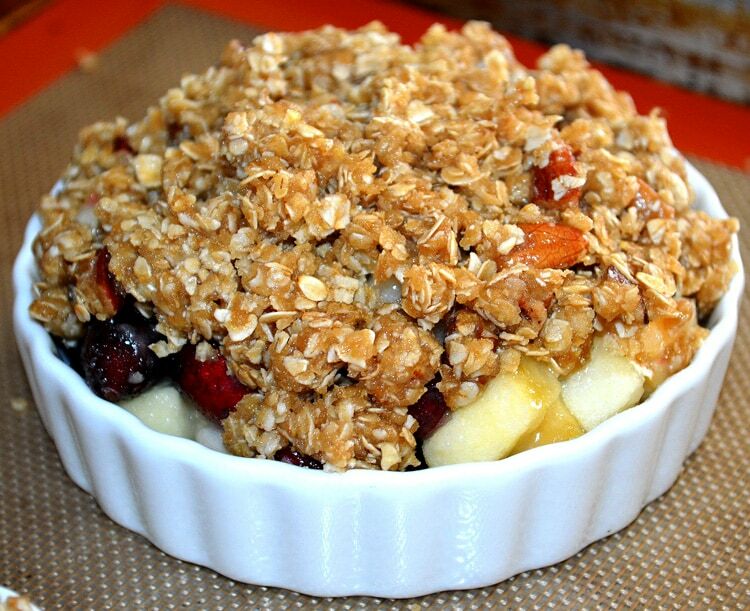 You can also use a larger baking dish to make this recipe (less chance of bubbling over). Allow to cool for 15 minutes before serving as that sugar is very, very hot. Serve with vegan vanilla ice cream.